All that talk about Latinos not wanting to vote for a black president turned out to be dead wrong. 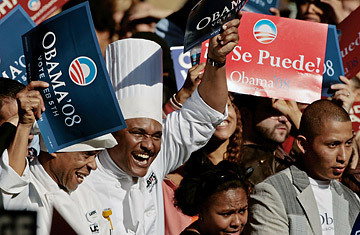 A majority of Latinos – 68 percent – voted for Sen. Barack Obama, according to exit polls. And we played a crucial role in helping Obama win. Latinos helped swing several crucial states – Colorado, Florida, New Mexico and even Virginia – for Obama, according to my analysis of exit poll data. Also, journalists got tired of doing the white men won’t vote black story. They’re used to that story arc, so they’re looking for new twists. (During the Los Angeles riots there was a lot of talk about Korean market owners being racist towards black. I’m not saying it wasn’t there, but these stories are a lot more complicated than what the media presents us.) So they started to thrust that onto us. Yes, there are conservative Latinos out there. Some are one issue voters (abortion), some consider themselves “moral” voters (anti-gay marriage, proving that they have selfish morals) and others have been brainwashed to think that Republicans are fiscally conservative, though Bush spent money as if he were Paris Hilton shopping on Rodeo Drive. Latinos voted 15 percentage points higher for Obama than they did four years ago for Sen. John Kerry, a white man. CNN exit polls showed 76 percent of Nevada Latinos voted for Obama, 73 percent in Colorado, and 69 percent in New Mexico. And NALEO estimates that Latinos helped swing Virginia for Obama. As of 10 a.m. the margin of victory in Virginia was 155,862. NALEO estimates that 67,000 Latinos voted for Obama. Obviously, a coalition was at work here, but Latinos helped close the gap. In Florida, where the margin of victory (as of 10 a.m. today) was 198,768 votes, an estimated 548,000 Latinos voted for Obama. The later figure comes from exit polls conducted by the National Association of Latino Elected and Appointed Officials. It marked the first time a majority of Latinos in that state have voted Democratic. That’s because the percentage of Cuban-American voters in Florida, who traditionally have voted Republican, were trumped by other Latinos who have been migrating to the state. Puerto Rican, Honduran, Colombian, Venezuelan, Dominican, Salvadorans and other Latinos tend to vote progressive. Cuban-Americans used to comprise 70 percent of the electorate in Florida, according to Bendixen, but now they’re about 50 percent. – We know an authentic leader when we see him. – We won’t let hucksters play racial politics with us.